Secondly, I have never seen such a cheap pineapple! 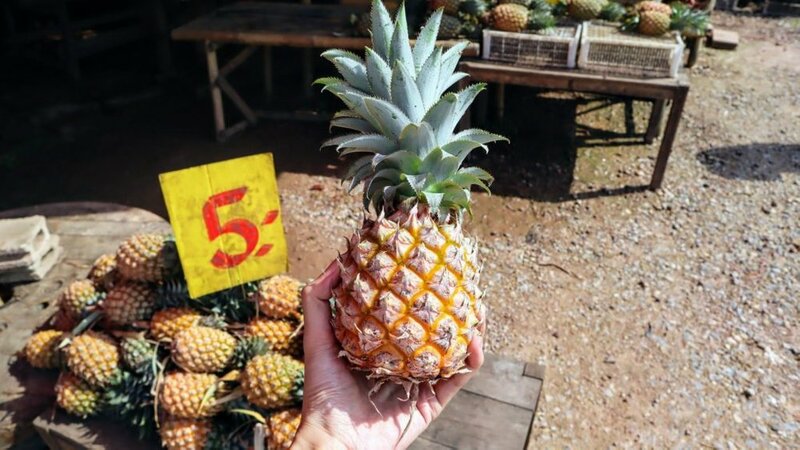 Well, probably it's not the biggest pineapple you would come across but hey, its price is so shocking even for Thai person like myself. Yes, there's some reason behind it. Chumphon (จังหวัดชุมพร), the a humble and friendly province we just went visit a few weeks back. On the way from Chumphon city centre traveling down a bit lower part to visit awesome places, like, a weasel farm where they produce one of the most expensive coffees in the world, Koh Phithak (เกาะพิทักษ์), a small islands where you can go stay with a local and has load tons of fresh seafood they catch, etc. 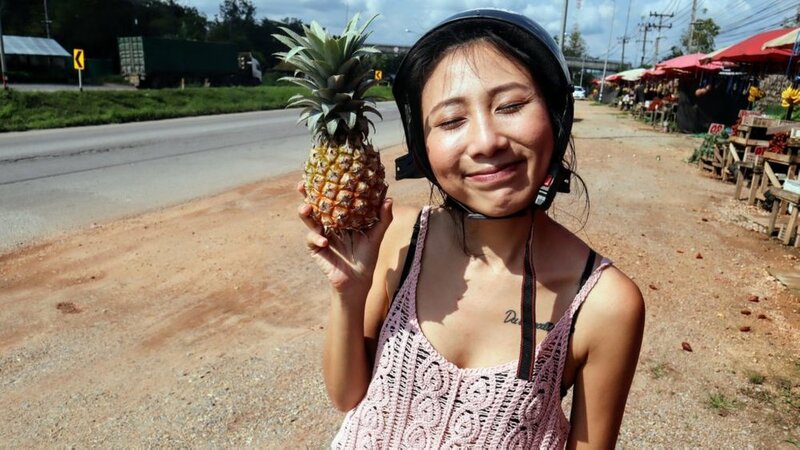 We passed a districts called Sawi (อำเภอสวี) which is known for its fruits like this pineapple and salak they grow themselves and have them sold right on the main road at these stalls. Most of the customers, I'm sure they are tourists travelling through just like us or those locals who buy a whole bunch and sell them for more expensive in the city centre. There's a bigger size one for 10 THB each. We of course, gave them a go and we went for a bit bigger one as it's 2 of us. To be honest, how small it is and after we cut out the peel and its eyes (Black dots all over, I don't know what it's called), there are so little pineapple meat left compared to other pineapples I have eaten. Well, still such a good deal and literally, it tastes great! it's probably the cheapest pineapple I have seen in my life! If you're ever in Chumphon, one thing I would recommend is to rent a motorbike/scooter and ride out of the centre. We found this randomly when we're riding down to some awesome spots down south. 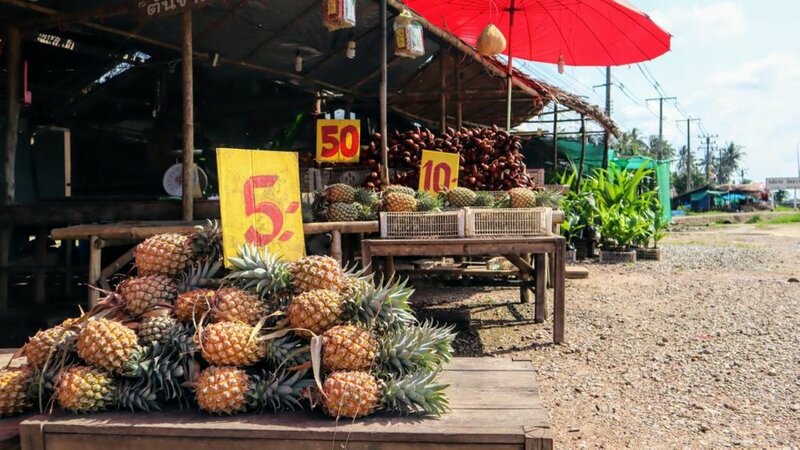 You sure should go check out around this area so that you have a chance to taste this delicious pineapple grown in the area and yes, yes, yes, super duper delicious and inexpensive! Here's Sawi district on the map. Last giveaway was about this piña!! The winner who guessed it right - 5THB!! !